The Holidays Matter network was formally launched today at the third annual Holidays Matter Conference hosted at the World Travel Market (WTM) event in London. The network will, for the first time, provide a framework for organisations who believe that every single person in this country should have the opportunity for a break away from home. Today in Britain seven million people cannot find the money for an annual holiday and still more miss out because the challenges of daily life are too great. to bring together organisations under the Holidays Matter banner to present a coherent message using consistent terminology. The UK tourism industry contributes 9% of GDP and employs over three million people. The industry is a lifeline for many communities across the UK who depend on tourism for jobs and long-term economic viability. Commenting on the launch John McDonald, Director of the Family Holiday Association said “We believe that Holidays Matter. They broaden horizons, provide a break from every day stresses and strains and create memories that last a lifetime. “In Britain today, five million people cannot afford even a simple day out. We simply cannot afford to have so many people excluded from the many benefits a break or day trip can provide. Organisations are invited to join the network by completing a simple form. The information gathered will, in time, deliver a comprehensive overview of provision across the UK. Qualifying organisations will be able to display the Holidays Matter mark. 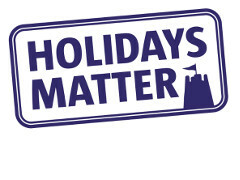 The Holidays Matter’s website www.HolidaysMatter.org.uk and Twitter feed @Holidays_Matter also launched today. Holidays Matter will be administered by the Family Holiday Association.